Which Art Student Are You? 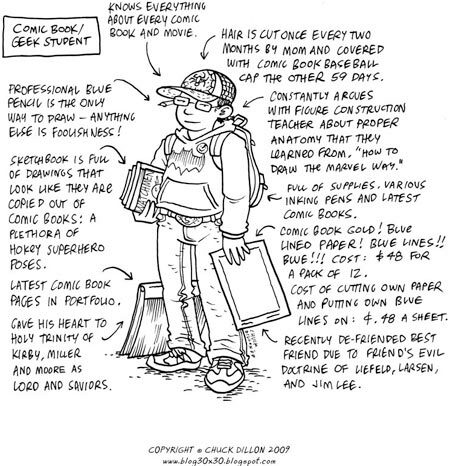 Cartoonist and illustrator Chuck Dillon, who teaches at the Hussian School of Art here in Philadelphia, has condensed some of his observations about students over his 10 years of teaching, and produced cartoon drawings/infographics of 20 student “types”. Inspired in part by Daniel Clowes Art School Confidentaial, a graphic story (made into a movie by Terry Zwigoff) that did a bit of similar classification of art students, Dillon came up with 20 classifications, like Student 1.0, the Anime Student, the Snob/Fine Art Student, the Mom Student, the Comic Book/Geek Student, etc. Dillon posted them on his blog, 30×30, asking “Which Student are You?“. You may be disinclined to identify, as most of his characterizations are negative and drawn from the inevitable frustrations of a teacher who is trying to communicate something through the barriers people often erect in the name of identity, but it’s amusing to see his take on them. Personally, I found it difficult to identify for another reason. Enough years have passed since I was in art school that many of his types don’t resonate with me, largely because the social/pop culture phenomena to which they’re tied (anime, metal, gaming) didn’t exist at the time. Other types with which I might have identified (60’s counterculture types) no longer apply. Also I went to a different kind of art school, Hussian is a small commercial art school, a sharp contrast in some ways to the medium sized fine arts academy that I attended. Still some things are universal, and even though we all know it’s not a Good Thing to classify people by their appearance, it’s fun to sort into “types”. It’s also fun to compare Dillon’s categorization of student types with his assessment of himself over time in a two part series called “Through the years…” and “Through the Years (part2)“, which preceded his student types, and was inspired by the Draw yourself as a teen meme started by webcomics artist Dave Valeza (see my post about Draw yourself as a teen). The rest of Dillon’s blog varies from posts about his process to train sketches to various finished and unfinished projects, like his Philadelphia Zoo Annual Report Comic Strip. Dillon also has a web site which showcases some of his other work. Similar reaction as yours, doesn’t really resonate much with my memories of being an art student in the early 80s. And speaking as a therapist (my current day job), this guy is really pissed off… My fantasy is he is one of those teachers I had who not-so-subtly communicated that this wasn’t what he REALLY wanted to be doing with his life. Gaetano Porcasi is a Sicilian artist and school art teacher. His paintings are considered unique not only for their social and political commitment but also for the technique and choice of typical Mediterranean colours from which a strong and deep Sicilitudine (Sicilian mood) emerges. The 2003 itinerant exhibition Portella della Ginestra Massacre is a good example: in 1947 a group of Sicilian farmers was shot and killed in Portella by the outlaw Salvatore Giuliano and his men under orders from the local Mafia mobsters and big landowners in order to stop the farmers’ attempts to occupy and plant uncultivated local land. His historical paintings which denounce the violence and oppression of the Mafia find their counterpart in his paintings which depict sunny Sicilian landscapes rich in lemon, orange and olive trees, in prickly pear, agave and broom plants. They show the wealth of a land that has been kissed by God but downtrodden by man. In painting the sky of his native Sicily Gaetano uses several different hues of blue and it’s from this sky that his pictorial journey starts. In his paintings the history of Sicily, which has always been marked by its farmers’ sweat and blood and by their struggles for freedom and democracy, finds its pictorial expression in the fusion of the red flags of the workers with the Italian flag in a sort of Italian and Mediterranean epopea. The red flags and the Italian flag stand out against the blue sky that changes its hues according to the events, the seasons, the deeds and the moods that are painted on the canvas. The luxuriant nature of Sicily with its beautiful, sunny, Mediterranean landscapes seems to remain the silent, unchangeable and unchanged witness to events and the passing of time. Here people are only accidenti, they aren’t makers of their own life. Thus Gaetano makes a clear-cut metaphysical distinction between a benign, merciful nature and Man who breaks the natural harmony to satisfy his wild, unbridled ambition and selfishness and who becomes the perpetrator of violence and crime. Gaetano is also an active environmentalist and his fight against all forms of pollution has already cost him a lot of aggravation.